The wild-looking Coryanthes macrocorys, seedlings of The 'Dove Orchid', an October growing tip and more! Hello everyone! With the cooler evening temperatures for many growers, now is a common time for many orchids to begin spiking. We want to share a couple of interesting orchids today that are seldom seen in photos or for sale. This is a wild looking flower from an orchid that comes from Peru, also known as the bucket orchid. Its unique function is to drip liquid into the lip (shaped like a bucket) in which its pollinator, male Euglossine bees, fall into and get stuck in the liquid. The only way out is the exit that contains the pollen. A second trip is required for fertilization. Check out the video below from Jerry Fischer to learn more about this fascinating plant. This was our most liked Instagram post so far, so please throw us a follow if you haven't yet to see more awesome images! Coryanthes like to grow warm to hot and need plenty of water and fertilizer to flourish. They are quick to produce seed and germinate, which is why we self-pollinated the flowers this time and are hoping for seedlings available in 2021. It's a wait, but well worth it with such a rarity! We know these won't be available for quite some time but couldn't resist sharing the plant in the meantime. We do offer another really cool orchid that is similar called Coryhopea Predator, check it out, there is also a new video on the product page to watch! This is a highly sought after orchid which is the national flower of Panama. In Panama, it is also considered a special flower to be used in a wedding bouquet. It is referred to as the 'Holy Ghost' orchid or the 'Dove Orchid' due to the appearance of a dove coming in for a landing in the center of the flower. They are very aromatic and can reach a large size when mature. We currently have seedlings available that should reach flowering size in 2021. This is another plant that does have a long wait until you'll see the flowers but it is very hard to find! 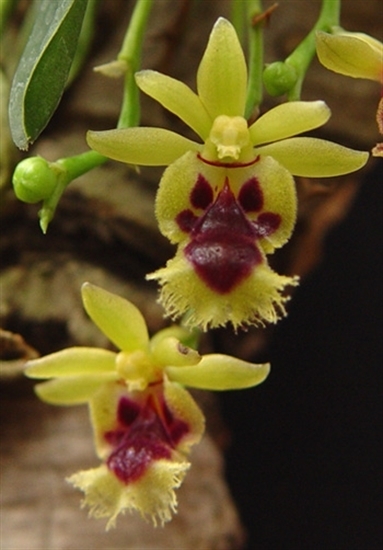 Another great miniature species from Taiwan we have available right now is Haraella retrocalla (In-Spike now! ), which has sweet citrus-like fragrance and can flower more than once per spike. It is easy to grow and can be grown in a small pot or mounted on a cork slab. For those orchid growers who like to grow seedlings from flasks, we are now starting to list our own flasks at mature stage ready for deflasking. We just put up two new primary crosses of miniature Cattleyas (Laelia sincorana x alaorii) and (Catt. aclandiae x Laelia alaorii) that are cram-packed with plants ready for potting. We typically use a small Orchiata bark mix or New Zealand sphagnum moss in 1.5” plug trays when deflasking most Cattleya type crosses. Here is a new video of the Phcal. Kryptonite 'Ursula' AM/AOS! For those who have been growing outdoors during the summer months, pay attention to your night time temperatures. Many orchids do not want to get cooler than 50 degrees in the evenings. You can always research about your specific genera or species to gain more knowledge of its tolerance levels. In addition, pay attention to the moisture levels of the pots. Cold and wet orchids can often lead to rot. It is better the plants are brought inside at that point or kept outdoors when the potting media is only slightly damp to dry. In addition, both spring and fall months are good times to evaluate your potting media. Is it staying wet longer than usual? Is the plant showing any signs of stress? Then the potting media may be broken down and in need of repotting. You can check out our supplies section for new pots and potting mixes. Check out our current In-Spike section!